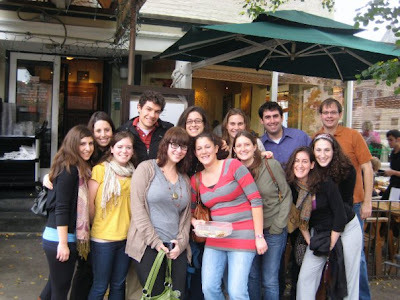 Ladies & gents, please enjoy a guest post from one miss Rachel BC, the first guest blogger to review the Great DC Brunch Tour of 2009/2010. We'd taken a quick hiatus from our brunching, but we're BACK, & Rachel reviews the not one but TWO places we forgot to tell you about - & we assure you it won't happen again. Brunch well, all ye hungry Washingtonians! Welcome to the New Year, loyal Suburban Sweetheart readers! After taking some time off from the Great Brunch Tour for work & holiday travels, we resumed on the first weekend of 2010 with a wonderful meal at Founding Farmers in Foggy Bottom - but I’ll leave that review to another RBC & instead do my best to catch you up on where we’ve been since our first very successful stop at Crème Café on U Street back in October. Apologies for the delay, but you know what they say – better late than never. In the New Year I resolve to use fewer clichés, but again – that’s another post for another day. Our second brunchventure took place at Rosemary’s Thyme in Dupont, an old favorite of many in our group. We enjoyed benedicts, pides (a Turkish pizza-like treat often topped with fried eggs) & tasty French toast. Rosemary’s was a great place to accommodate our large group – nearly 15 friends showed up to enjoy the company of one miss Micaela HT, who graced us with her presence before traveling to Rwanda for a year of service (yes, she’s a better person than the rest of us). Rosemary’s gets high marks for its creative menu – particularly the pides & Mediterranean influence throughout– and its friendly service, but I’d recommend returning on a day when you can sit outside and enjoy all the people watching that 18th street has to offer. Rosemary’s is like an old Snuggie – warm, comfortable, reliable, but it’s not going to knock your socks off. Stop 3 on the Great Brunch Tour took our group back to U Street, this time to Ulah Bistro, which our fearless leader Kate had ‘previewed’ to make sure it was worth our time & critical expertise. I'm automatically a big fan of any place I can walk to in 10 minutes or fewer, & luckily three of our four stops have fit this criterion! After our first two brunches brought groups of at least 10 each, we decided to venture to Ulah with a slightly smaller crowd. This was a good thing, as Ulah has a minimal seating area & more intimate feel than some of our other destinations. Just a few blocks past Crème (at the busy 14th & U intersection), Ulah is much quieter, though I’m not sure why - the food is equally delicious & on par in terms of price. The décor at Ulah is simple but welcoming – lots of warm wood on the walls and floor, wine bottles lining the sills, and simple decorations throughout. But we didn’t waste too much time savoring the atmosphere - we had come for the food & were ready for plenty of it. We quickly surveyed the menu, made our choices (being sure to sample a variety of items off the menu), & caught up on the events of the previous evening as at least one of us nursed hangovers with ample water & coffee. Writing several weeks later, I can’t fully recall all the meals around the table, but I had the pleasure of savoring the French toast, a plate I won’t soon forget. Topped with a drizzle of raspberry sauce, syrup, & (the real finishing touch) a dollop of creamy mascarpone, I can honestly say that Ulah makes some of the best French toast I've ever had (though my favorite French toast of 2009 is still Zaftig’s Deli in Brookline, Mass.). With a perfect ratio of bread (the good, thick kind) to eggs to keep the toast from drying out during frying, a nice balance of sweet & savory between the syrup and mascarpone, & four thick slices to fill me up, this meal did not disappoint. I could've used a bit more color on the plate (fruit salad never killed anyone! ), but I can’t complain. Like at most brunch spots, Ulah doesn’t serve its sweet dishes with potatoes or bacon - an unfortunate reality for those of us who enjoy both the sweet and savory sides of the best meal of the day - but the reviews of the sides from others at the table were equally impressive. The boys around me enjoyed hearty omelets full of veggies & proteins; I can only assume that they were tasty, as neither of them saved any for me to try! If you’re looking for a relatively quiet brunch spot in the neighborhood & want to enjoy both sweet & savory options without the lines at Kramers or The Diner, Ulah may be the place for you. Call ahead because the dining room is small, but don’t worry – they do feature a full bar (showing football games in season), & you’re sure to enjoy a nice plate of food. 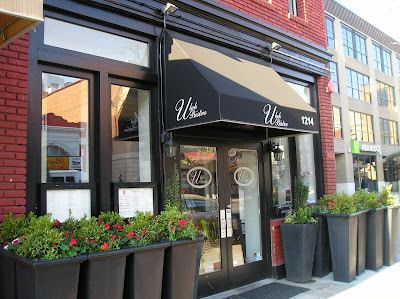 All in all, Ulah was a delicious stop on the tour, one that this diner will surely will return to. OK, let’s be honest, I already went back for a second shot at the French toast last week – & it was still good! Food: 8.5 - see paragraph-long French toast description above.